It’s the 30th Anniversary of IDEA Part B, Section 619, and IDEA Part C! 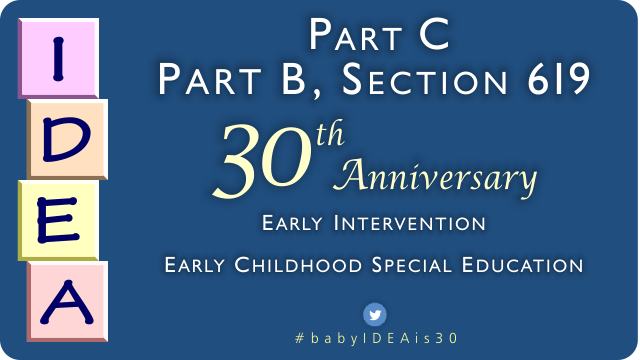 During the week of October 3-7, OSEP celebrated 30 years of early intervention services and preschool special education under IDEA. During the week, the 30th Anniversary Webpage highlighted the impact of early childhood provisions in IDEA. Stories of parents, practitioners, researchers, and even individuals who received early intervention and preschool special education services as a result of this law, were shared. Don’t forget to join the celebrations online-it’s not to late…connect on social media using the hashtag #babyIDEAis30! And be sure to check out Ron Benham and Tiffany Gundler’s contributions!